Am I the Only Person Who Doesn't Want More 'Harry Potter'? Usually when I start a question with, "Am I the only one who ..." the answer is a resounding yes. I suppose I just have a contradictory nature, and I'm not shy about voicing an unpopular opinion. Which is exactly what I think I'm about to do when I ask, "Am I the only one who doesn't want more Harry Potter stories?" Please don't mistake me for a hater. Quite the contrary. I am a huge Harry Potter fan. The books, the movies, the theme park — I'm obsessed with all of it. My final high school English paper was a dissection of the Harry Potter phenomenon. I faced a crippling fear of roller coasters and the subsequent post-ride panic attack to go on Harry Potter and the Forbidden Journey at the Wizarding World of Harry Potter at Universal Studios in Orlando. I think J.K. Rowling is a genius, and her sweeping magical saga is the crowning literary achievement of the 20th and 21st centuries. Which is why, in the wake of Rowling publishing a new Harry Potter story as a Rita Skeeter gossip column on the interactive website Pottermore, I have this one, simple request: Please. Just. Stop. There's nothing inherently wrong with "Dumbledore's Army Reunites at Quidditch World Cup Final." It's short and sweet; Pottermore's coverage of the Quidditch World Cup, which coincided with the FIFA World Cup, was clever, and writing the column in Skeeter's hallmark acidic tone was a nice touch. However, Skeeter's probing questions in the column, including whether Harry's and Ginny's marriage is on the rocks and if Neville Longbottom has developed a drinking problem (WTF?) left me asking a question of my own: Is this where the legacy of Harry Potter is headed? Like tons of your fans, I think your books are perfect as-is. They’re perfect not because every word and subplot works, but perfect because when I look back on my reading experience, it’s a flawless, deeply treasured memory. I share those sentiments completely. Reading the original complete series and discovering that fantastical yet fully developed world was such a rich, rewarding (dare I say magical?) experience for me as a reader that every whisper of sequels, prequels and spin-offs is like its own individual boggart, striking fear into my heart because it threatens the integrity and purity of that experience. The more the Harry Potter world is tampered with, the greater the danger becomes of it being tarnished or ruined altogether. As a writer myself, I understand the creative impulse — that constant, almost nagging voice in your subconscious demanding that you be productive or else your life has no meaning. I suppose even the author of the best-selling book series of all time is susceptible to that. But Rowling has already found other creative outlets that are working out well. I can also imagine that as difficult as it was for readers to let go of Harry, Ron, Hermione, et al., it must be damn near impossible for their creator to just leave them on Platform 9 3/4 smiling as the sun sets, and move on with life. 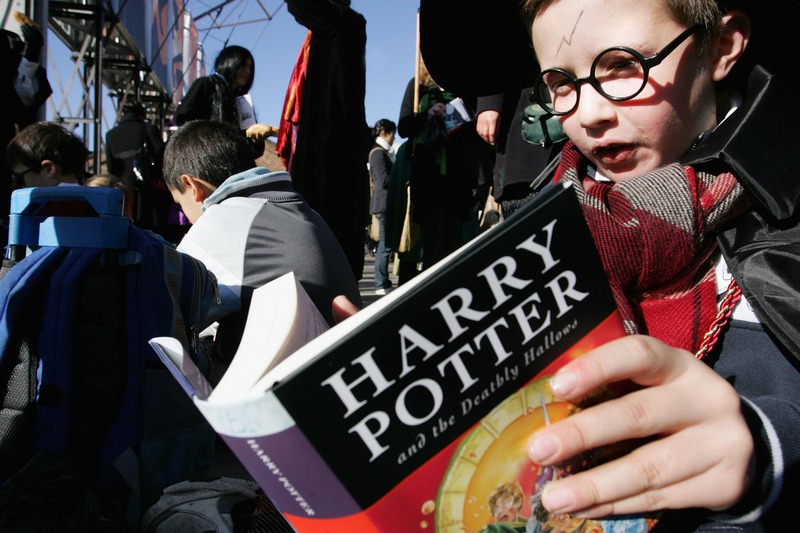 The next day, like millions of other Harry Potter fans the world over, I woke up, got out of bed, and began to learn how to live Life After Harry. It took some getting used to; luckily there were two (no, wait, make that three) film adaptations to look forward to, and that delightful theme park in which fans could finally feel like we were wizards, and actually taste Butterbeer. I re-read the series start to finish, delighting in how I could now pick up on threads and foreshadowing I hadn't before, and enjoying the sense of satisfaction one gets from reading a well-told story. But I also moved on to other books, finding new heroes to root for and new villains to despise, content with my Harry Potter experience being a fond memory. Which is why with every rumor of a new Harry Potter story or film, it feels like an ex popping back into my life, asking if I want to give it another go. It's tempting; we had so many good times together — playing Quidditch, sneaking off to the Forbidden Forest, defeating the Dark Lord — but deep down inside, I know I shouldn't. It will never be the same, never be as good as the first time around. It's probably better to leave well enough alone, and preserve the memory (in a Pensieve or otherwise) as is — pure, untarnished and wonderful. Please, J.K., that's all I ask of you.